Dr Andrew Murray, minister of the Dutch Reformed Church of Wellington between the years 1871 – 1906, was such an innovative social leader. His vision and dream to empower the women of South Africa through Christian based education and training has led to the establishment of the Huguenot Seminary in 1874 with the help of two educators from the Mount Holyoake Seminary in Massachusetts. Over the years a number of institutions grew out of the Huguenot Seminary: a school for boys and a school for girls which was later merged to become the Hugenote High School; A training College for teachers which later became part of the Faculty of Education of the Cape Peninsula University of Technology and the Huguenot College which later became the Huguenot University College. 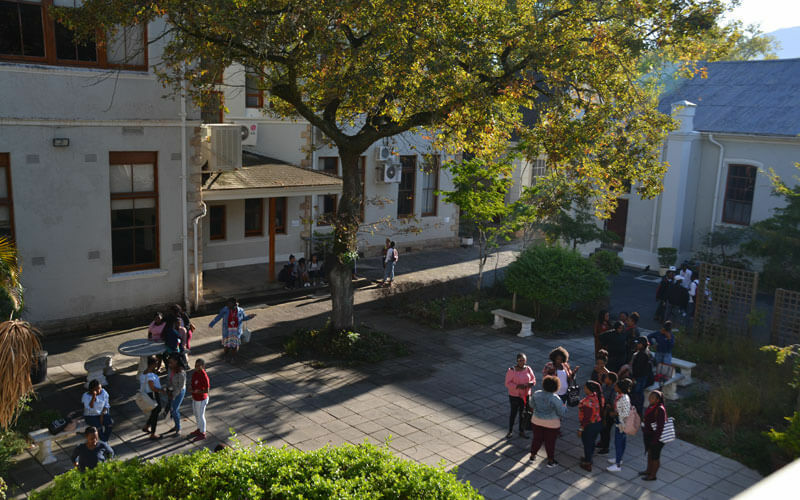 The Huguenot University College was closed in 1948 and reopened in 1951 as the Hugenote Kollege – a training institution for social welfare workers and mission workers. In the early 1970’s Hugenote Kollege entered into an academic partnership with Unisa which allowed Hugenote Kollege to offer graduate as well as post graduate programmes. This partnership was terminated by Unisa at the end of 2012 leaving Hugenote Kollege with no accredited programmes and no students. The Board of Directors then took initiative to reposition Hugenote Kollege as a private Christian post-school training institution focusing on the training and equipping of innovative social leaders to participate in God’s mission of caring for and the healing of this world. Hugenote Kollege visualizes communities of dedicated and well-equipped people serving the proclamation of the reign of the Triune God in this world. Hugenote Kollege is a private Christian post-school training institution focusing on the training and equipping of leaders to participate in the Triune God’s mission of caring for and healing of this world through innovative social service delivery and the proclaiming of the reign of God. nurture and enhance the spiritual development, sense of calling and readiness to serve of students and staff.